cliffs. 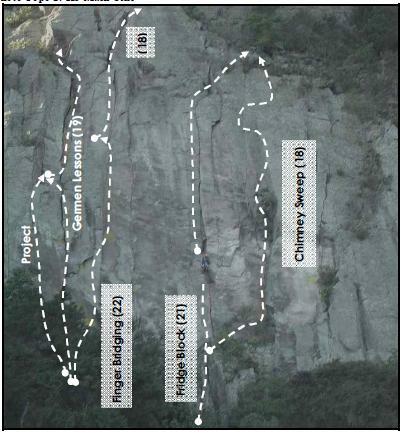 The south facing lower wall, is a riolite crag with a multiple crack lines. The lines are described from left to right. Finger crack 2nd crack from the left hand end of crag. The centerpiece of the crag, the obvious crack line right up the middle of the face. Start up a small corner to gain the large ledge. From here just blast up the crack, no rests and few face hold makes for 25m of pure sustained jamming. At the top of the face continue up the crack for another 5m then traverse out right to the large pine tree (belay). (Pro CD, Wires, Hex). The name comes from the fridge size boulder I removed from the overhanging section just prior to leading the climb.